If you enjoy owning one-of-a-kind pieces of art….this will greatly interest you. 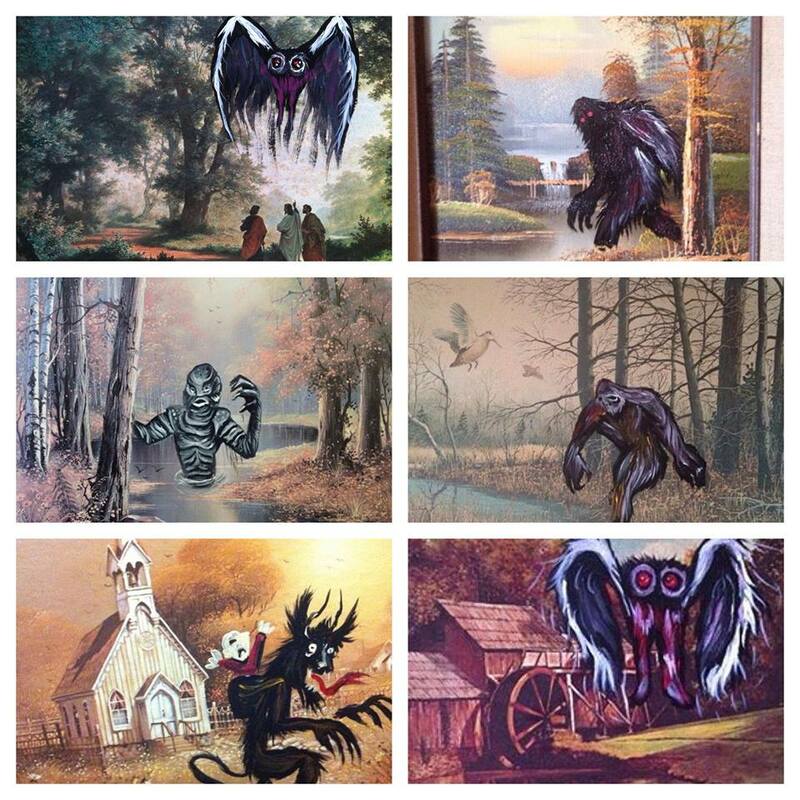 Have you heard of the Bob Ross of Bigfoot? Eerie Eric Fargiorgio is a good friend of mine, who also happens to be a very talented artist with an interest in all things strange and odd. 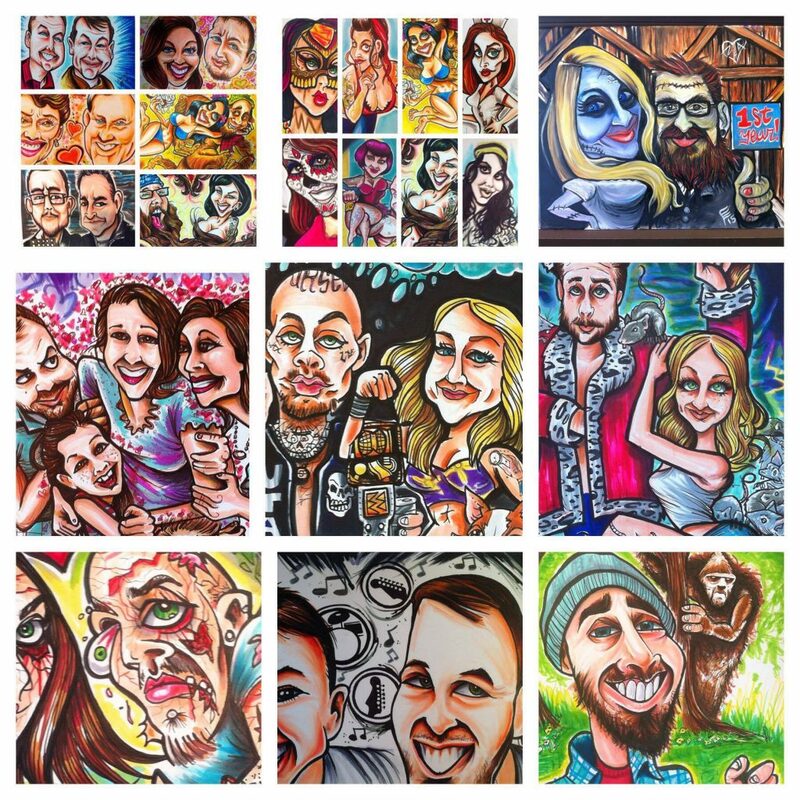 “From tattooing, to concert posters, painting bigfoot/cryptos into existing nature paintings, I have done it all. I started my career in the arts back in 1998. I was 17 years old and I sent an illustration I made to a well know top #100 band “The Bloodhound Gang”. They loved the piece so much they used it as the cover to one of their major albums “One fierce beer coaster”. The notoriety of this accomplishment led to numerous jobs creating art for CD covers, shirts, and even tattoo designs. So naturally, I thought to try my own hands as arthritic and pieced together as they are at tattooing which isn’t easy for people that have regularly working fingers and hands. I began officially working as a tattoo artist in 2005. Things appeared to come easy for me on the surface but what most hadn’t known at the time (and are just now coming to learn) is I was diagnosed at a year and a half with juvenile rheumatoid arthritis. I spent my childhood and most of my teenage years in the care of The Shiners hospital for sick kids. Surgery after surgery they tried to correct my quickly debilitating condition. By 31 I had already had my hips replaced three times, I am now in the process of scheduling the fourth perhaps fifth replacement. I spent my time at shiners drawing and doodling anything to keep my hands moving. Who knew that one day that would be how I make my living. I’m so grateful for my accomplishments, and for how far I have come as an artist. I left Shiners around age 17 and moved to Pittsburgh, where I graduated from the Art Institute with my associate’s degree. From there, I got my first job with Dorrance Publishing illustrating children’s books… something I still do from time to time. I illustrated one in 2015 dealing with children with disabilities, a topic very close to my heart. Dorrance eventually closed its doors and I moved back to Erie and began my career tattooing which opened many doors in this growing art scene. I have been fortunate enough to show my paintings and illustrations in many settings. Papa Joes (back in the day), Arts and drafts since the beginning. The provocative art show at the Avalon hotel featured 15 pieces, Art Lore grand opening, and The Co-op as a featured artist, and I have also been lucky enough to be artist of the month twice for Scotty’s after hours. 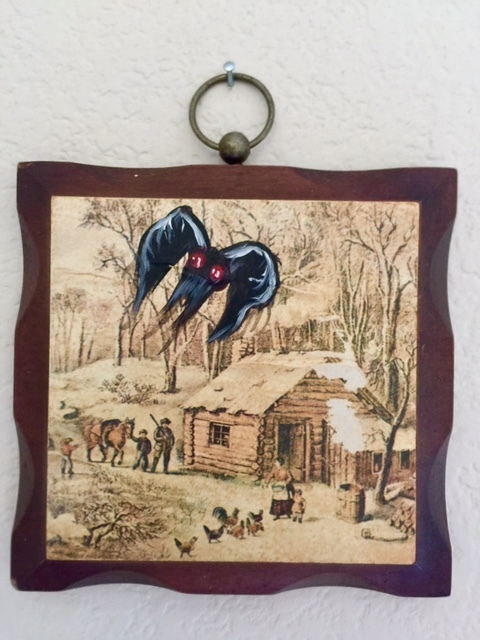 I myself have met Eric and his lovely wife Kerrie at a number of conferences and festivals during my stay in Ohio, and purchased my own Mothman painting that now hangs proudly in my home. 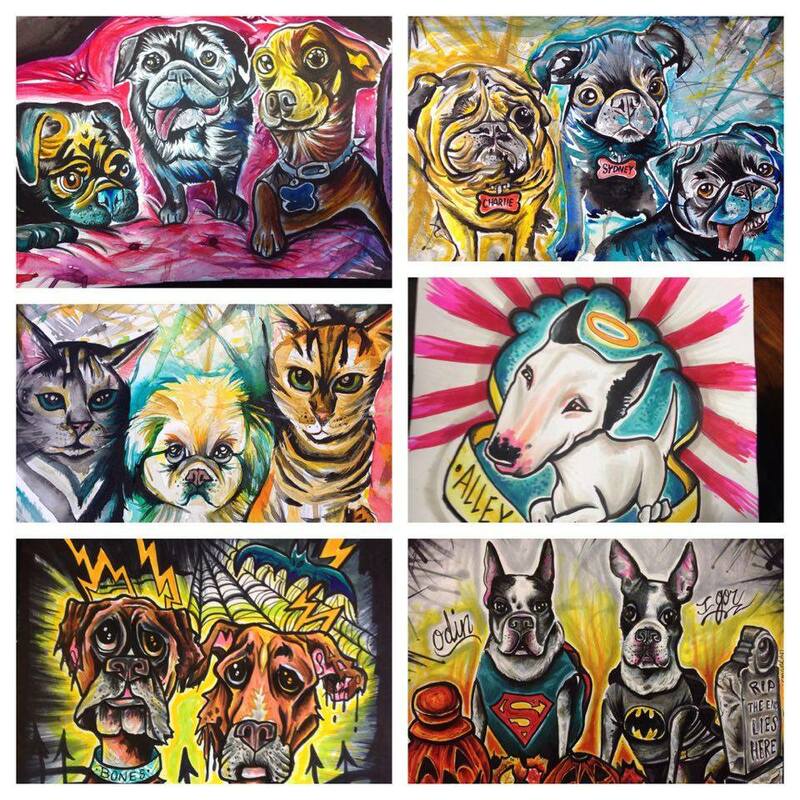 As you read above…Eric executes incredible tattoos, personal portraits, caricatures, (dubbed eerieericature’s) designs logos, T-Shirts and even adds famous cryptid creatures and UFO’s to otherwise quite normal or mundane oil paintings. Eric is stuck at home now, unable to go into work due to a complication with his condition. He is looking to do more commissioned art while at home. 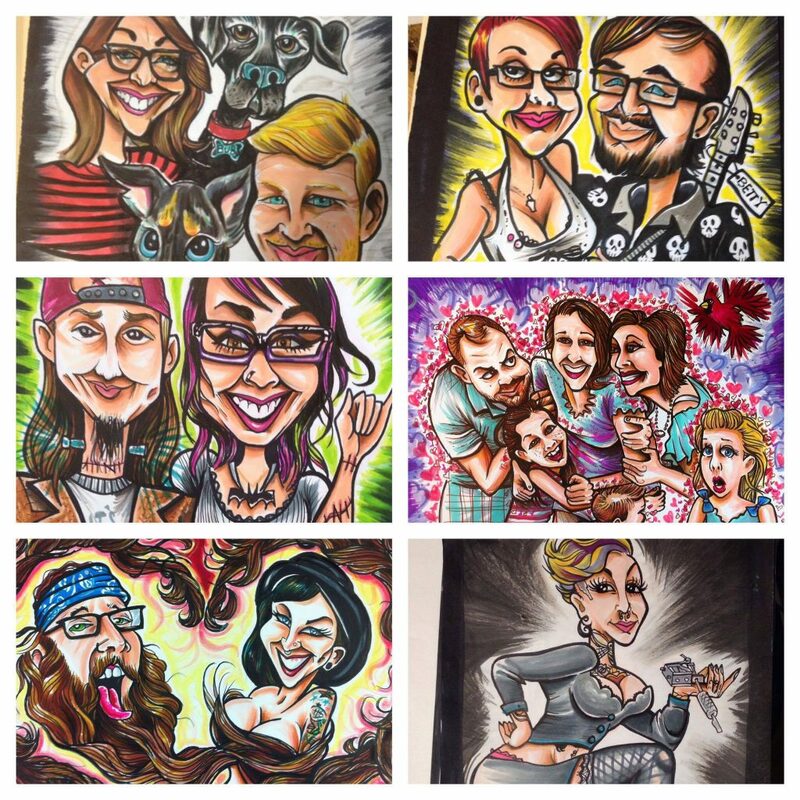 If you’ve ever considered getting a truly unique piece of artwork or personalized caricature of you, or your pet…this is a great time to do it!